*Update: FREE Raffle Drawing on Opening Night! -First 500 people will recieve a free raffle ticket at the door. -Prizes include free books, shirts, doll sets and other surprises. Artist Kevin Dart has created a series of beautiful movie posters in his unique retro style for movies we can only wish to watch. Along with a few friends, Dart will be releasing a new book containing a collection of posters, soundtrack covers, and other illustrated memorabilia. 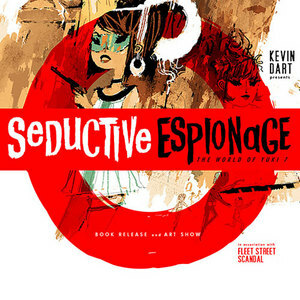 Dart and friends will be exhibiting their work for the book release party. This event will be the first opportunity to purchase the book.